Oct 30, 2012 by Paul O'Connor Comments Off Posted In: Say What?! I don’t know about you, but I like to keep my morning drive as short as possible. I time the traffic, change lanes, and use every short cut I can find if it will save me five minutes getting into the office. Who knew that super-villains did the same thing? 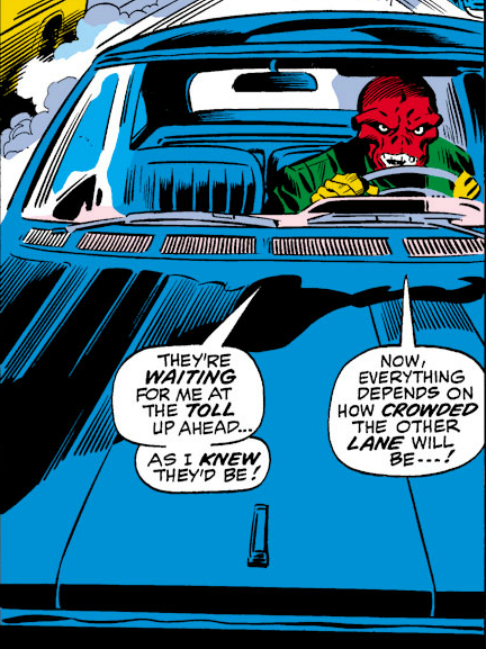 However late you may be, if you see the Red Skull in a muscle car thundering up on your back bumper, I suggest you yield the fast lane. That kind of road rage nobody needs!